Listen to your favourite songs in music player. It supports MP3, WAV, FLAC, eAAC+, WMA etc. file types. Two years ago, LG took a chance and surprised everyone with the G2. The G3 upped the ante and the G4 makes it a streak. LG's top offering mixes unique design with unique features in a winning combination. Removable battery and microSD card slot. Unlike HTC, LG is able to fashion a meaningful and worthy successor, since the LG G4 manages to outdo and make marked improvements in several areas over its predecessor. 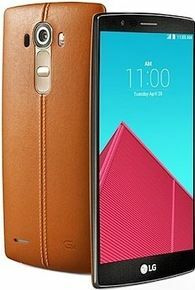 From its new vegetable tanned leather finish, to its amazing new camera system, the LG G4 collects all the necessary ingredients, and combines them accordingly to make it a formidable force in the hectic smartphone space. After seeing what its neighbor has done with Galaxy S6, LG responds accordingly with a product that earns high marks in several categories to solidify the company’s continuing presence – one that’ll no doubt stay relevant and in contention for the foreseeable future. At the end it is one of the "THE BEST" phone.. I am using moto g4 plus . moto has quickly heating for normal use. After I am exchange my moto for LG g4. This camera quality very very bad. Battery drain using one hour. No fast charge. Net connection error .